Korean drama of the week "Drama Special - The Crying Woman"
Also known as "The Dirge Singer"
A female slave or woman of a private home who was paid for mourning at funerals is called a dirge singer. Dangeum is a dirge singer but her daughter Yeon-sim doesn't want to be one because she would have to mourn and lament for her life. Yeon-sim runs away to become a gisaeng, a female entertainer, thinking that smiling for life is better. But it's not easy as she's a daughter of a dirge singer, a low-born. Yunsu is born out of wedlock and is angry at his life as he cannot do anything because of his position. One day, Yunsu's brother, who is a true noble, dies. And Yunsu becomes the chief mourner of the house. He has never been treated that way so he gets confused. Will they be able to change their unfortunate destiny? 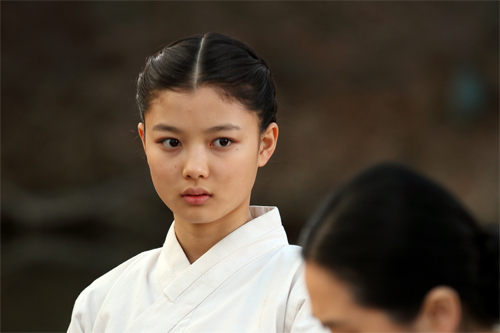 "...Kim Yoo-jung puts in a wondrous performance here as a young woman using the tools at her disposable to get what she wants, even if that seems less than ideal, because of the importance of these feelings to her sense of self. This works to make "Drama Special - The Crying Woman" a simple, heartful story that transcends time, even as we're so clearly stuck in the trapping of the costume drama..."